NFL.Shop.com recently released a list of the top 25 selling jerseys from the 2010 NFL season. Steelers Safety Troy Polamalu picked-off the #1 spot from Broncos rookie QB Tim Tebow, who held the top spot until November. Despite the drop off, the Gator great ended up finishing #3 and was the only rookie to make the list. 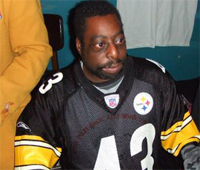 Due to Big Ben's off field issues, Steelers fans turned their full attention to Troy Polamalu's #43 jersey. Over the past five years, no defensive player in football has come close to selling as many jerseys as the crazy-haired cornerstone of the steel city's latest dynasty. Despite having a train wreck of a season, the Dallas Cowboys led all teams with three players finishing in the top 25, which could be attributed to the fact that Wade Phillips has nothing to do with selling jerseys. The Steelers, Packers, Vikings, Jets, Eagles and Patriots finished tied for second, with each team contributing two players to the top 25. Per usual, field generals dominated sales jersey sales in 2010, with Quarterbacks constituting nearly half of the top 25 (12). The most surprising player to make the list was by far Cleveland Browns running back Peyton Hillis, who finished #22 thanks to a combination of Fantasy Football performance, pre-game parking lot binge drinking and the loss of LeBron James. 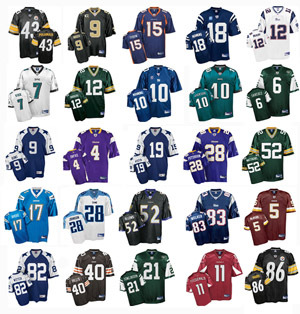 Below is a look at the complete list of the top 25 NFL Jersey sales from the 2010 NFL season. Our website wholesale all kinds of jerseys . BOB LILLY DALLAS COWBOYS TRADING CARD. VG CONDITION. Bob Lilly Super Bowl VI Autograph! 2018 Panini One Encased! Dallas Cowboys!